This recipe for Brown Butter Chocolate Chip Cookies with Sea Salt are rich, indulgent, and absolutely over the top. Crispy, chewy, intensely flavored cookies that will definitely become your new favorite recipe. I’m just gonna come out and say it. These are the best chocolate chip cookies I’ve ever had: Brown butter chocolate chip cookies (with sea salt on top!) to be exact. 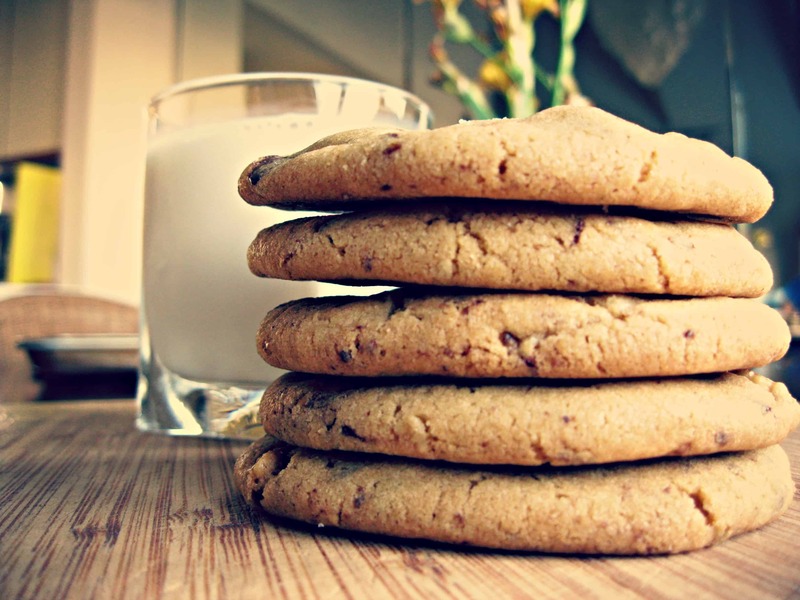 Chocolate chip cookies are an American classic. When made right- with good quality chocolate, real butter, crisp edges and a chewy middle- there seems little room for improvement. Right? 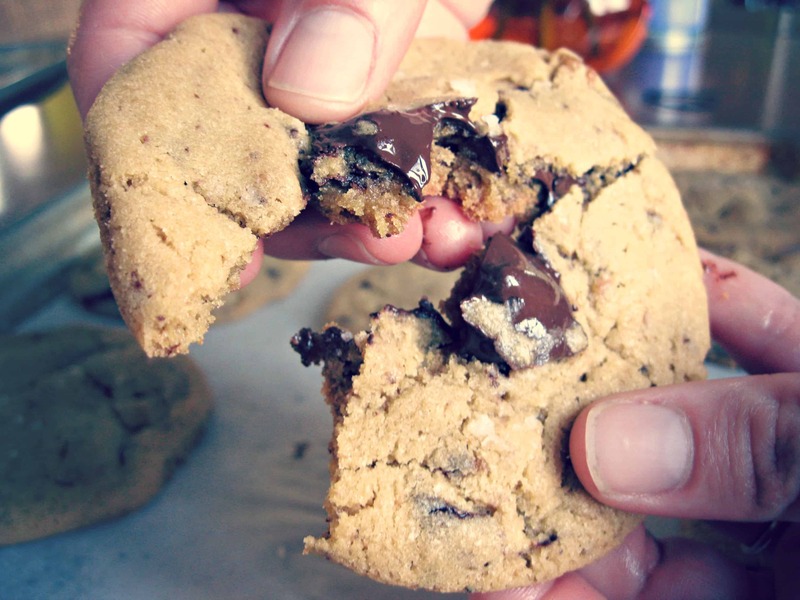 There’s a reason why the chocolate chip cookie has stood the test of time to become our favorite: Because its good. Really good. But these cookies are better than good. I hedge at the word, but these cookies, man… these cookies are epic. When I read Joy’s post about these cookies, I knew I had to make them immediately. Luckily, I always keep the ingredients for chocolate chip cookies on hand, you know, for moments just like this. But Joy’s recipe calls for 1 stick of browned butter and 1 stick of regular softened butter. I thought, why only brown one stick of butter when you could bump up that brown butter flavor and brown both? I mean, is there such a thing as too much brown butter? But if you answered yes, then, I’m sorry, but you’re just wrong. More brown butter. Always. Those are words to live by. Joy also uses 3 different kinds of sugar in her recipe: brown, white, and molasses. That’s just a lot of extra stuff to have to dig out of the cabinets. So in the name of laziness, I tested the recipe using only brown sugar, and had pretty damn good results (if I do say so myself). Give these cookies a try, and I guarantee they will become your new go-to. If you can resist the urge to eat them all yourself, surprise your friends by randomly dropping off a few in their mailbox. You will totally make their day. And THAT will make you feel as good as these cookies taste. Promise. 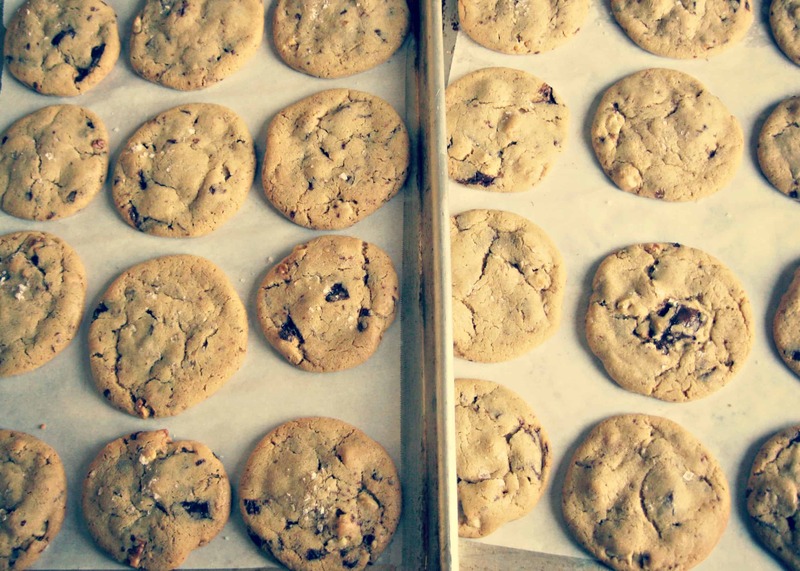 These cookies- like all chocolate chip cookies- are best served warm, right out of the oven. BUT, I’ve found that if you cool them completely, you can use two cookies to sandwich a giant scoop of vanilla ice cream (or homemade brown butter ice cream if you really wanna get down) in between. Place it back in the freezer to allow it to set up for about an hour before eating. Or if you’re like me, you’ll say “screw it,” and let the ice cream drip down your arm as you shamelessly slurp it down. Either way, you win. First, start by melting the butter in a pan over medium heat, swirling it around until it starts to bubble and froth. Keep an eye on it for a few minutes, until it starts smelling nutty, and the milk solids on the bottom begin to brown. Remove from the heat immediately to prevent the butter from burning (this can happen FAST!) 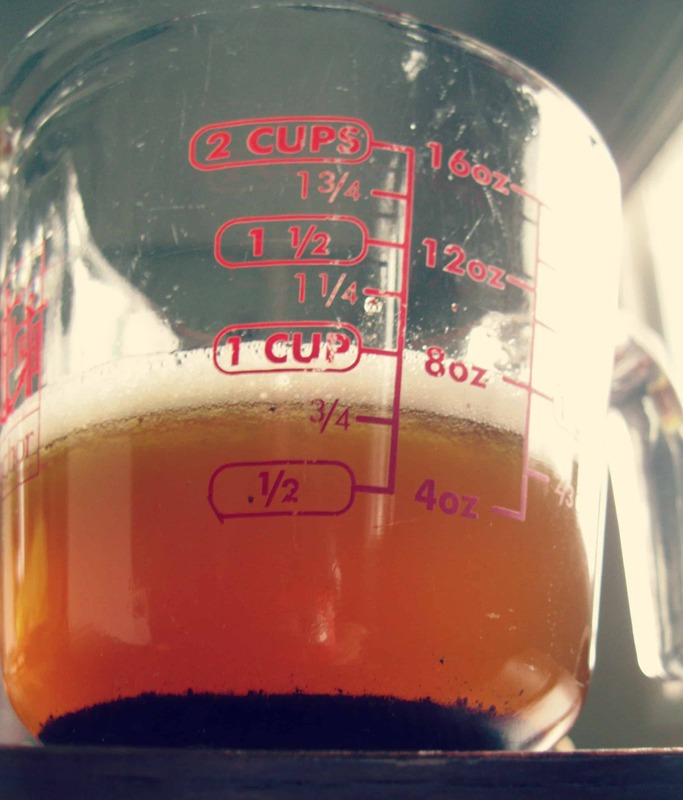 and pour into a bowl or measuring cup. Allow the browned butter to harden to room temperature, which will take a varying amount of time depending on how warm it is in your house. You can expedite this process by putting it in the refrigerator. You want the butter to be at room temperature, solid, but still soft. Place the butter in a mixing bowl and beat with the brown sugar for about 3 minutes, until the mixture is fluffy and smooth. Add in the vanilla extract, the egg and the egg yolk. Beat for another minute. Next add in the dry ingredients: the flour salt and baking soda. Turn the mixer on low and beat until the flour is just incorporated, not a second longer. Use a spatula to fold in the chocolate chips and nuts to avoid over mixing. It’s a great technique to employ here, as over mixing could result in a tough cookie. Refrigerate the dough for at least 30 minutes before baking. Don’t have time? Just bake them. No one’s judging you. And if you REALLY don’t have the time, just wrap the dough in parchment, refrigerate and store in an airtight zip-top bag for up to 4 days. Longer than that, throw it in the freezer. When you’re ready to bake, line two baking sheets with parchment paper or a silpat and preheat the oven to 350 degrees. Scoop out 2-tablespoon sized balls on to the baking sheets, leaving about 2 inches in between so the cookies can spread out as they bake. Sprinkle the cookies with sea salt, to taste — as much or as little as you like (I like a heavy sprinkle). Bake the cookies for 12 to 15 minutes (longer if the dough is cold), until they’re golden brown around the edges. Remove them from the oven, and allow them to rest on the baking sheet for at least 5 minutes before moving them. Store any uneaten cookies (um, right) in an airtight container for a few days. 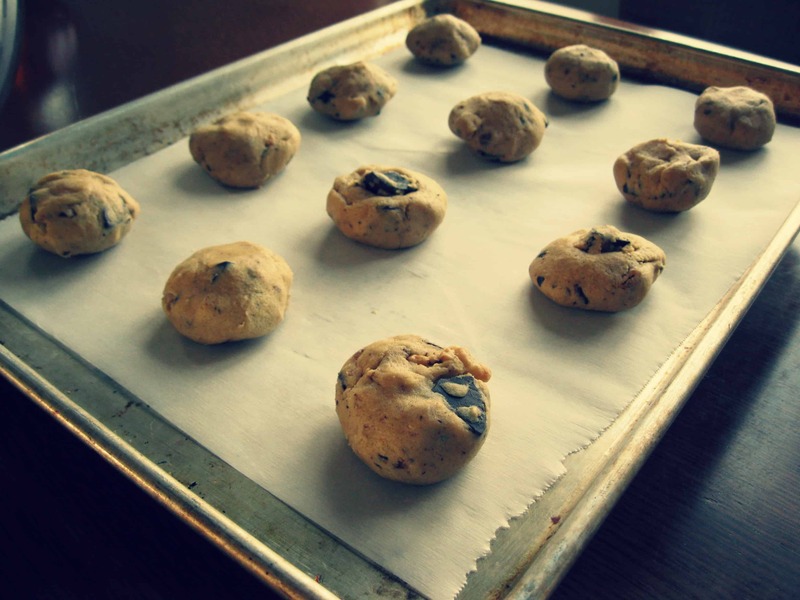 For longer storage, freeze the dough and bake the cookies fresh when you’re ready. TOO funny!! I was just wondering why my choc. chip cookies that I JUST made (and I haven’t made cookies in a while) became flat in the oven. I was searching the internet… found a couple of possibilities… then briefly checked my email to make it look like I’m actually doing something constructive on a Sunday… and HERE’S your blog about Chocolate Chip Cookies! Coincidence? I think NOT! hehehe!! Thanks for the pointers, but I wish you had posted this YESTERDAY before I made these semi-poor excuses of choc. chip cookies! You got it boo, but you have to share with Donnel! As if a chocolate chip cookie couldn’t get any better you decide to put ice cream into the mix. YUM. I think I know what i’ll be making this evening, Nicole! Thanks for sharing this delicious recipe, Joy always knows how to get a sweet tooth going! 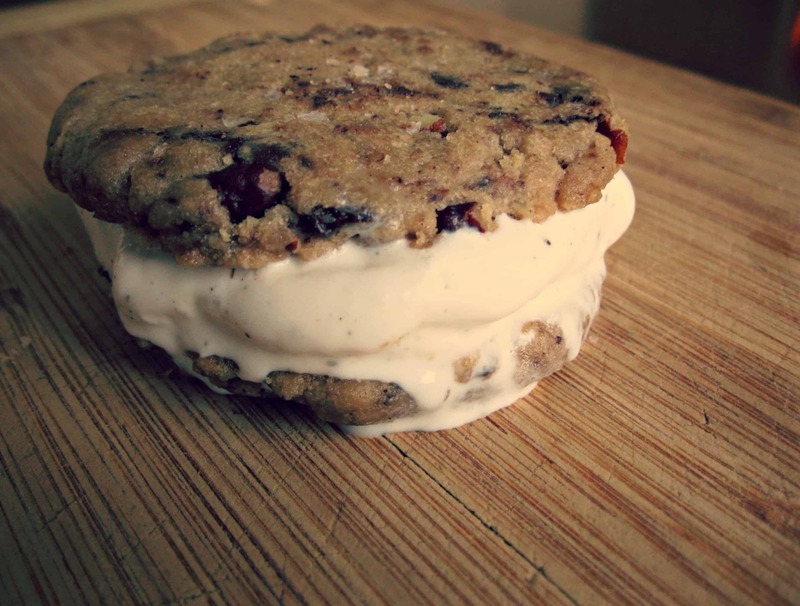 As if a chocolate chip cookie couldn’t get any better, you threw some ice cream into the mix. YUM. I think I know what i’ll be making this evening haha!